Annisquam Herb Farm: Baking powder . . .
Baking powder . . . I do not bake often enough to buy baking powder premixed. Years ago I found a recipe in Mary Webber's Frugal Family's Kitchen Book. 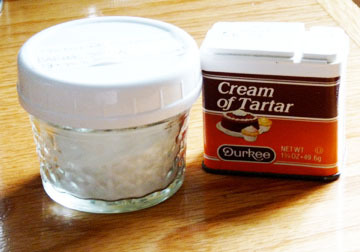 in place of 1 teaspoon of baking powder use 1/3 teaspoon of baking soda and 1/3 teaspoon cream of tarter. (I do not add cornstarch). If you do use baking powder perhaps this article would interest you!